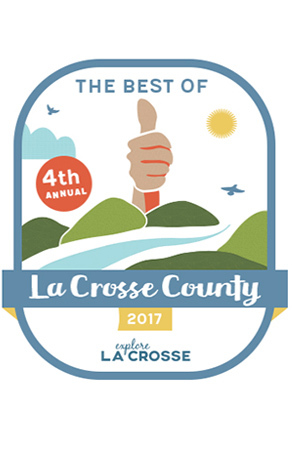 voted #1 Chiropractor in La Crosse County! Dr. Ben Breidenbach was also voted as #2 Chiropractor. we strive to provide the best healthcare in this community. We would like to thank our patients, team, and family for your support. The mission of Breidenbach Wellness Center is to serve the members of our community with high quality and excellent service in a comfortable and caring environment, focusing on the entire family’s health and well-being. We practice with a holistic approach, whereby our care is focused on the health needs of the entire individual, not solely their symptoms. Through this structural approach, we are better able to serve the people in our community to achieve optimal levels of health and wellness. We strive to make a difference in the world, and our community to help children and families reach their fullest potential in their health. The use of chiropractic care is not only to eliminate already existing pain, but it is also a way of preventing future pain and discomfort. At Breidenbach Family and Sports Chiropractic we individualize treatment plans for each of our patients. Our attention to detail and dedication to our patients means you will never be pressured into receiving a treatment you do not want or are not comfortable with. Our expert staff is here to help you and guide you through your treatment. Dedication to our patients means that we provide as many tools, skills, equipment, advanced techniques, and as much knowledge as possible to individualize your specific needs. The services provided by our staff are administered in a safe and comfortable environment. We conduct all of our testing, sessions, massage therapy, and other services within our own facilities. Breidenbach Family and Sports Chiropractic is always accepting new patients. Each of our three offices serving La Crosse, Onalaska and the surrounding areas, are equipped with the newest technology and equipment to help our patients. We accept most health insurance plans, while also providing affordable chiropractic care to those who are not insured. We encourage you to explore our site to find out more about us and our chiropractic treatments and the therapeutic massage options available to you in the La Crosse and Onalaska areas. We would like to thank you again for visiting us at our website. If you can’t find the answers to your questions, feel free to ask us yourself - just click Email Us or call any location to receive the answers to your questions from our experienced team. Our Philosophy at Breidenbach Chiropractic is to help and provide hope for people to share the truth about wellness without drugs and/or surgeries. We strive to make a difference in the world, and our community to help children and families reach their fullest potential in wellness. "I have had dizziness and migraines that has made my life almost impossible at times. I tried everything until a friend told me about Chiropractic care. Chiropractic Care has honestly changed my life for the better. I had many days where I couldn't even function. The care I have received has truly given my life back! Thank you Breidenbach Chiropractic!"